Wriggling their way in and out of trouble, The Bookworms pop-up to bring their stories to life! With a rickety handcart library and some novel ideas, surprises leap off the page wherever they roam. Join our funny guides as they worm their way into twisty and fantastic adventures through imaginative worlds. Rhubarb Theatre can’t wait to bring this 30 minute fun and fantastic show to the Spiegeltent! 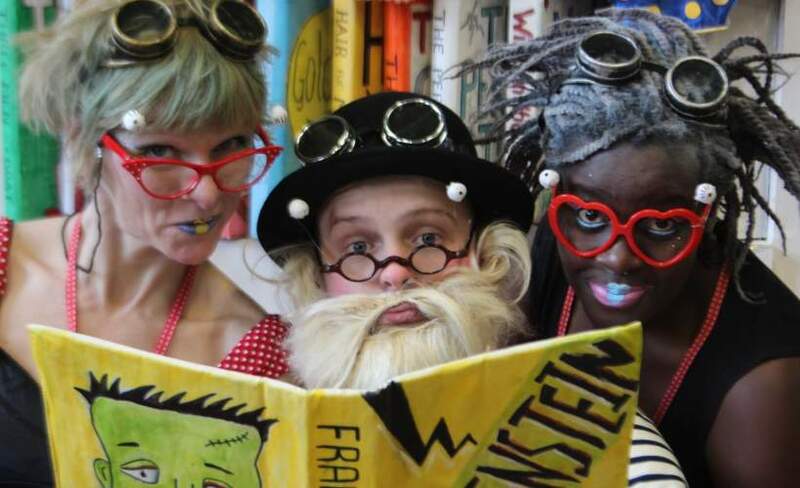 The Bookworms is perfect for children and families who enjoy live performance, character interaction, mime, physical theatre, mischief and laughter. Rhubarb Theatre delivers creative, original and theatrical experiences to entertain and stimulate imaginations of every age. Started in November 2000 by professional actors Philip and Kirsty Mead, Rhubarb Theatre tours internationally with a diverse programme of performances, street theatre, storytelling and workshops. Rhubarb always delight with their exciting and original adventures and have entertained audiences of all ages in schools, theatres, heritage sites, festivals and arts centres. They have toured to thousands of venues across the UK and beyond, taken premieres to the nationally acclaimed SPARK Children's Festival and Sydney Contemporary Art Gallery and are regular performers at Glastonbury as well as many other festivals, including Latitude, Wilderness, YNot Festival, Chilled in a Field, Boomtown, Cambridge Folk Festival and many many more.